ايشيا جو ھڪ ملڪ جيڪو ٻيٽن تي مشتمل آهي. ↑ "Republic act no. 8491". Republic of the Philippines. وقت March 8, 2014 تي اصل کان آرڪائيو ٿيل. حاصل ڪيل March 8, 2014. ↑ Philippine Statistics Authority 201429–34. 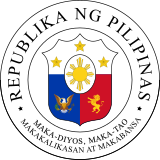 ↑ 5.0 5.1 "The Philippines - National Government Portal". www.gov.ph. ↑ "East & Southeast Asia :: Philippines". The World Factbook. Washington, D.C.: Author: Central Intelligence Agency. وقت July 19, 2015 تي اصل کان آرڪائيو ٿيل. حاصل ڪيل November 7, 2009. ↑ 8.0 8.1 8.2 8.3 "Philippines". World Economic Outlook. International Monetary Fund. ↑ "Gini Index". World Bank. حاصل ڪيل March 2, 2011. ↑ "2016 Human Development Report" (PDF). United Nations Development Programme. حاصل ڪيل March 21, 2017. ↑ Lucas, Brian. "Which side of the road do they drive on?". حاصل ڪيل February 22, 2009. ↑ "Presidential Decree No. 940, s. 1976". Manila: Malacanang. وقت May 29, 1976 تي اصل کان آرڪائيو ٿيل. حاصل ڪيل April 4, 2015. ↑ "Republic of the Philippines Independence Day". United States State Department. وقت September 15, 2015 تي اصل کان آرڪائيو ٿيل. حاصل ڪيل July 30, 2015. ↑ Calderón, Felipe (1907). Mis memorias sobre la revolución filipina: Segunda etapa, (1898 á 1901).. Manila: Imp. de El Renacimiento. pp. 234, 235; appendix, pp. 5–10..
↑ Dolan, Ronald E. (1983). Philippines, a country study (4th ed.). Washington, D.C.: Federal Research Division, Library of Congress. ISBN 0-8444-0748-8.